I really love USB-C. As far as I see it there are just upsides with the new standard. The connector is easier to use (no more trying to figure out the correct way to insert the cable) and it can be used for everything from data-transfer to charging your computer. This means that in a not to distant future you should be able to charge most of your devices with just one charger. At home I have a HP Spectre 13 that only comes with USB-C-connectors and recently I upgraded to a brand new 15″ Mac Book Pro at work, a computer also exclusively using USB-C. As much as I love the USB-C-port I do miss regular USB-ports on these computers. 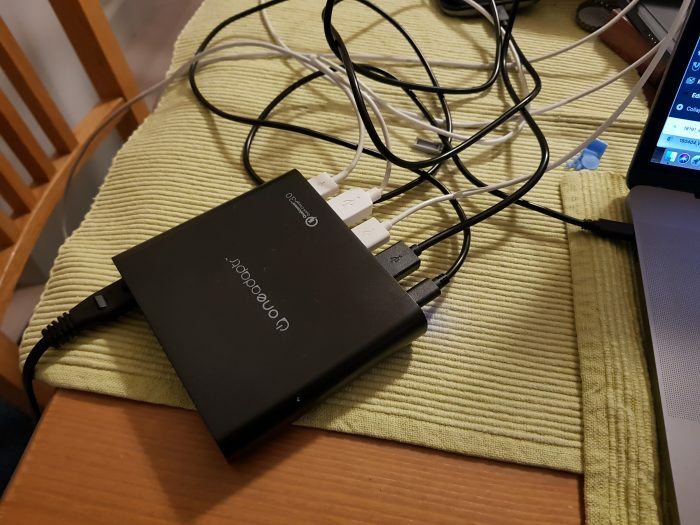 I also have several devices that still uses some other port than USB-C, for example a few Android devices that use Micro-USB and some Apple-devices with Lightning-ports. This is where the EVRI 80W USB C Charging Station comes in. 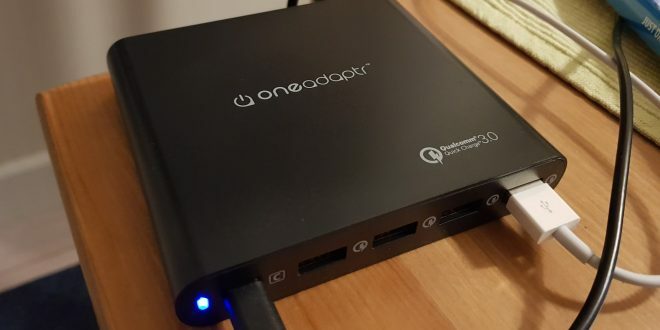 This is a slim 80W-charger with one USB-C and four QuickCharge 3-compatible USB 3.1-ports. It can charge everything from a phone to a Mac Book Pro via the USB-C-port and also other devices via the USB 3.0-ports. Is this the perfect charger for someone like me? Read on to find out. This is a charger that promises to take over the duty for all your charges in one swoop. 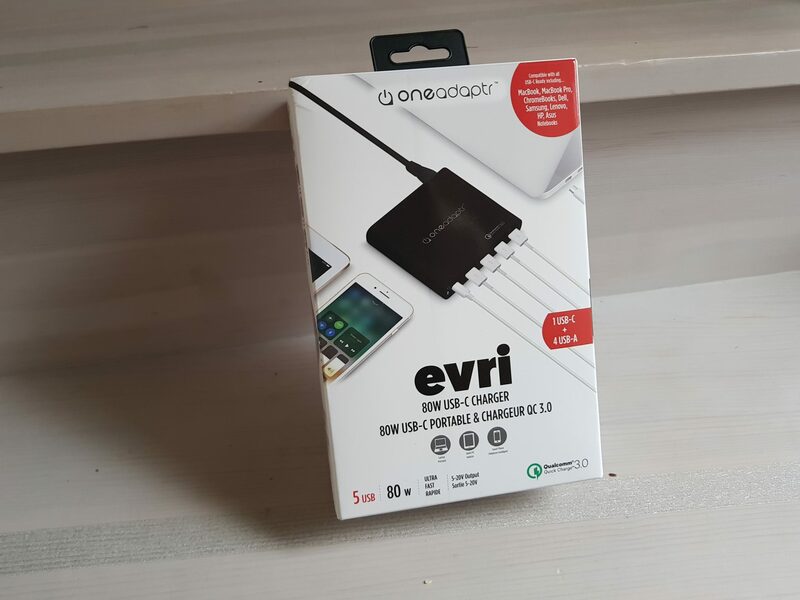 The EVRI 80W USB C Charging Station comes in a small package showing off it’s capabilities with a nice image. Inside the package we find the charger, a power-cable and (not visible here) a USB-C to USB-C cable. The charger is a bit larger than a modern Mac Book Pro charger but not as thick. It is also lighter at 248 g compared to the 309 g of the Mac Book Pro-charger. 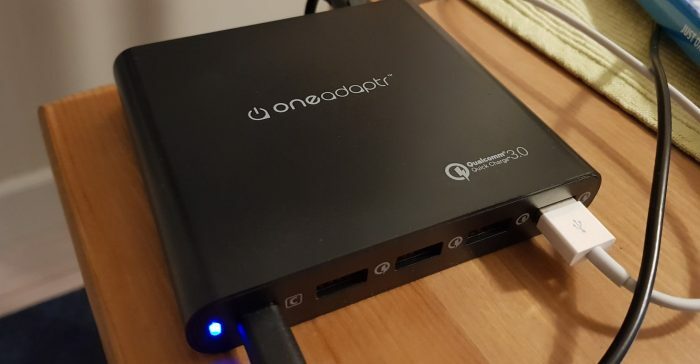 At the front you find the USB-C-port and four USB 3.1-ports that all are Quickcharge 3.0-compatible. The USB-C-port also is USB-C PD 2.0-compatible meaning it will charge the newest iPhones and iPad Pro’s faster. There is also a tiny LED on the front that shows when the charger has power. At the back we find a power connector accepting a regular power cord. I like the idea of being able to switch just the cord as it helps when I am traveling to a country like UK or US with their “weird” wall-connectors. So how does it work? Very well actually. 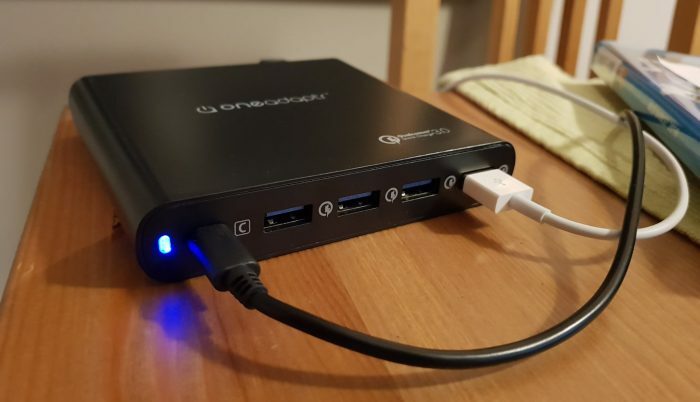 I’ve been using the EVRI 80W USB C Charging Station for a few weeks now and used it to charge my Mac Book Pro, my HP Spectre 13, my Samsung Galaxy S8+, Nintendo Switch, a Huawei P8 (using USB-A), a Motorola Moto X Style and several iPads. It has been very nice to just have one charger that has been able to charge everything. 1.5 hours or so to get a full Mac Book pro 15″ charge or 1 hour for the Moto X Style is not bad at all. In fact. It is excellent. 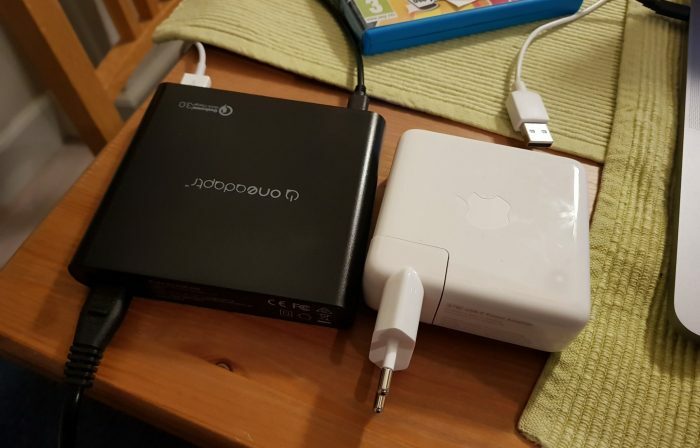 At times I did notice that the charger got a bit hot but never so it felt dangerous hot, not even when charging a Mac Book pro, 3 different iPad’s and a phone all at the same time. I am trying to find something that I do not like about the EVRI 80W USB C Charging Station but cannot really come up with anything. 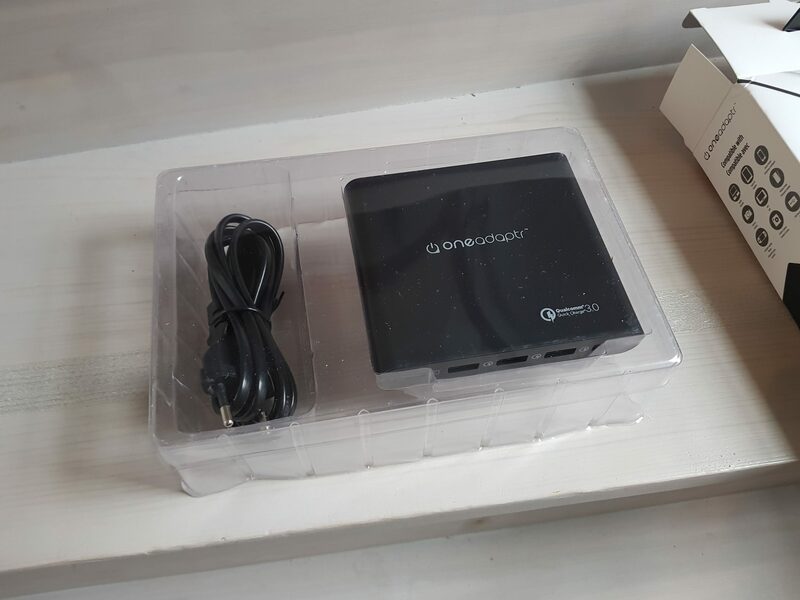 This is a product that works well and really is useful, especially for me that have a lot of devices and occasionally travels a lot. The charger has replaced 3-4 chargers in my bag as I travel to work every day. It is also reasonable priced. At around 69$ it is at the high end of similar devices but none of those I have looked at are as slim as this charger. 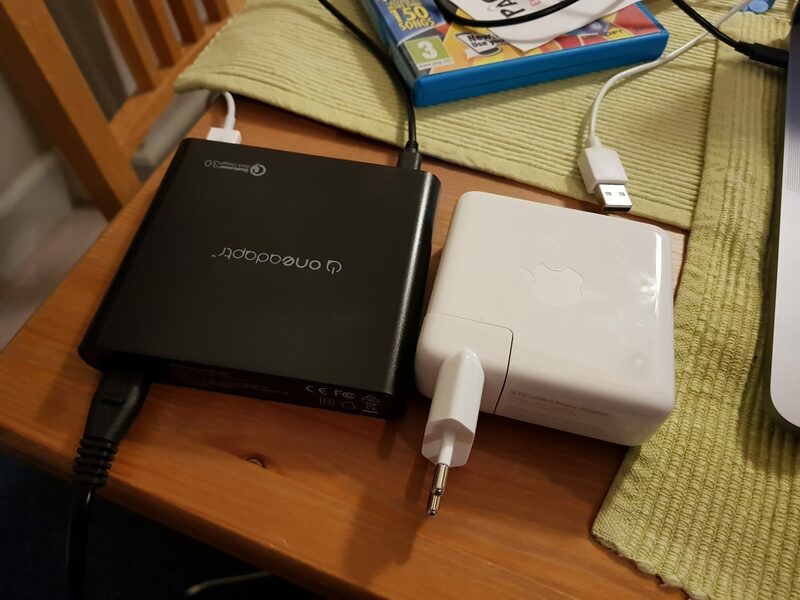 Can charge Switch, latest Mac Book Pro 15″ etc. Charge any USB-C MacBook/PC/device and 4 USB-A devices (iPhone, iPad, Android, smartphone, tablet) at the same time - USB-C to USB-C Cable Included! Last update on 2019-04-20 / Affiliate links / Images from Amazon Product Advertising APIBjorn3D.com sometimes has affiliate-links to Amazon that can earn us a small fee if you buy via this link. These affiliate links does not weigh into the review text, summary or score. We can have these links on both bad and good products. We will just offer you a way to buy them and support us, regardless what we think about the product. 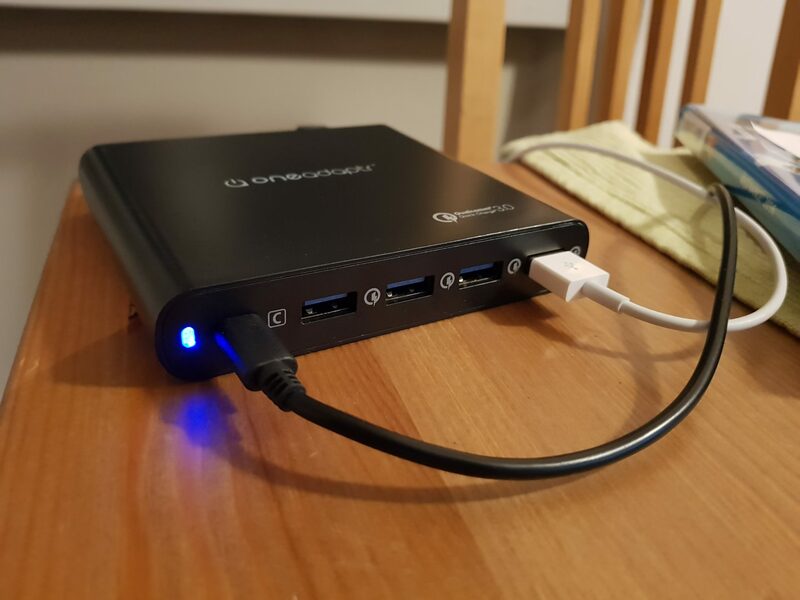 The EVRI 80W USB C Charging Station is a impressive charger that should be on the shopping-list for anyone with lots of different devices.